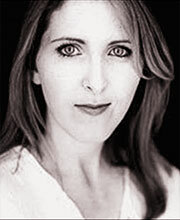 Fenella Woolgar trained at the Royal Academy of Dramatic Art (RADA). Shortly after graduating, she starred in Stephen Fry’s film Agatha and has since performed in films by Mike Leigh (Vera Drake), Richard E Grant (Wah-Wah) and Woody Allen (Scoop and You Will Meet a Tall Dark Stranger). She has worked in theatre at the National Theatre and The Old Vic, and won the Clarence Derwent Award for Best Supporting Actress in the West End in 2012.